The Knicks have been struggling on the road all season no matter they played against winning teams or losing teams. Last night, they faced an 18-17 Pelicans team went 3-1 on their last four games, featuring an Anthony Davis that scored 33 points in his previous two matchups. 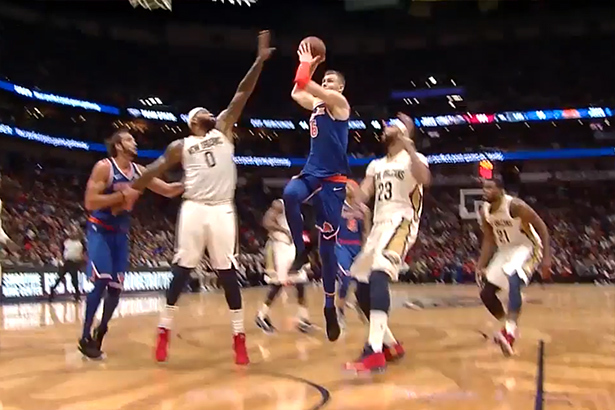 But last night, Kristaps Porzingis erupted into the guy that stared the season and blasted New Orleans with 30 points, shooting 11-22 from the field to help the Knicks win their 3rd game on the road, in a 105-103 thriller. The Knicks started the game well, took control from the first quarter and as the game advanced they manage to build a double digit lead that went as high as 16 in the third quarter. And then again, in a similar fashion that we’ve seen in Chicago, New York blew their lead in the fourth quarter and allowed the Pelicans to go on a 13-0 run while they were unable to score on a span of over six minutes. However, in a surprising turn of events, the Knicks fought back and this time they didn’t allow it to slip away. After Darius Miller put his team up by seven, the Knicks responded with six points in just a minute, with Joakim Noah finishing a strong dunk that cut the lead to just one. The final couple of minutes were intense. As Davis made a couple of free throws to give the Pelicans a five point advantage, Porzingis drained his only tree pointer of the game, off Jarrett Jack’s assist, then the same duo completed a dunk that tied the game at 101. Those were the last points scored from the field and the game was to be decided from the three point line. Jack was fouled with 9 seconds left, made both throws and on their last possession, with a play that gave Davis the open look, his long three hit the rim and the Knicks survived. Jack had 15 points and 7 assists, Courtney Lee scored 9 and Michael Beasley led the bench with 15 buckets and 5 rebounds. Kyle O’Quinn and Frank Ntilikina finished each with 8 points but the surprise from Jeff Hornacek was the time he gave Joakim Noah. Noah played his first important minutes of the season, logging 13 on the court, including the entire fourth quarter, with a mission to contain DeMarcus Cousins. Jo scored 4 points and grabbed 4 rebounds and his presence was appreciated. Anthony Davis scored 31 points and collected 9 rebounds for the Pelicans and Cousins dropped 29 buckets and had a game high 19 boards. Jrue Holiday and Etwaun Moore also finished in double figures with 13 and 12 points. The Knicks returned to .500 and now both teams share a similar record at the end of 2017 with 36 games played.